How do I Make Artificial Plants Shine With Orange Glo? 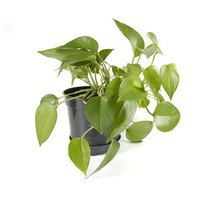 Over time, artificial plants collect dust and dirt from the air, making their leaves look dull and less like the glossy leaves of living plants. A simple dusting or rinse in soapy water cleans them, but restoring luster to the leaves makes them look more like they're alive. The manufacturers of Orange Glo Wood Polish and Conditioner claim it cleans wood surfaces, but it's also handy for cleaning and adding shine to the leaves of artificial plants. Brush dust and cobwebs from the plant with a feather duster. If the plant is especially dirty, rub a wet paper towel over an inconspicuous leaf to make sure water won't harm it, then place the plant in a sink and rinse it off thoroughly with warm water from a sprayer. Let it dry. Spray a little Orange Glo on a leaf. Set the spray as fine as possible, but if it looks spotted or uneven, rub over the leaf with a paper towel to spread the Orange Glo around. Decide whether you like the results. Spray Orange Glo over the whole plant, wiping the leaves with a paper towel if necessary to polish the shine.